Blogging about current issues and solutions surrounding Information Technology and Systems Integration in K-12 schools as well as the things we go through integrating technology into education while keeping systems and networks secure without impacting the educational processes of students and teachers today. 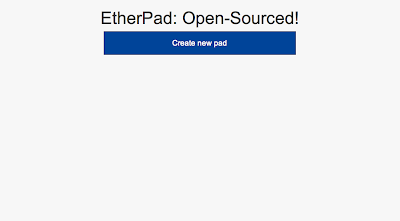 Today I wanted to create a blog post documenting the steps necessary to create a Etherpad virtual machine in our organization. This should work great for anyone else as well. This article is a mix of instructions from Ubuntu documentations found here and here. 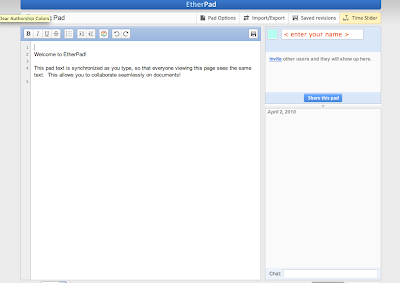 This Etherpad virtual machine was also built on VMware vSphere 4.0, so there are a couple of steps specific to that environment, but in previous testing, I know that the same process works just fine in VMware Fusion as well. First thing to do is to create a new virtual machine and installing the OS. 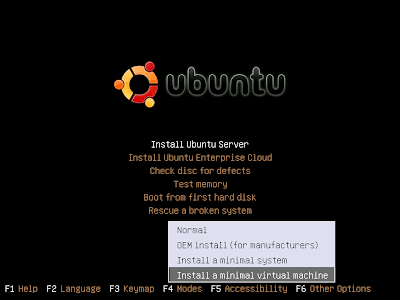 We will be using Ubuntu 9.10 server and using the minimal virtual machine installation. You can see in the picture below how you can get this installation option, it is under the modes section you can access by hitting F4. Once you work through the installation of the OS which I won't go through here, you will be left with a very minimal Linux installation that we will then want to get brought up-to-date for the rest of the install. This should get you the latest versions of everything installed by default. You will then need to install three sets of packages that are required for the installation of VMware Tools. Once these are installed, then you can ask VMware to install the tools, and you will complete the install by issuing the following steps. Once this has been done, I always install a couple of other packages to make it easier to administer the server. These are optional, but I will keep them in the documentation in case you are interested. This concludes the basic setup of the Virtual Machine. Now we can move on to the specifics of setting up Etherpad on this machine. One thing to be careful of is that when you install the mysql server it is going to ask you for a password for the root user. Make sure that you write this down or remember it so we can use it later in the process. Next you will want to download the source code from Google. I prefer to put all of this code in the /opt directory on your server, but I have been known to use the /tmp directory as well. The following lines will get you all the source code necessary. You will then need to make some changes to this source code to get it to compile on Ubuntu, but I will try and simplify that as much as possible. The first file you will need to modify is titled makejar.sh which can be found in /opt/etherpad/trunk/infrastructure/bin. You will want to modify the file to make changes to two specific lines. You can use the command below to open the file for editing. You will see that in both cases you are strictly removing the /lib directory out of the path. By using ctrl-o and ctrl-x in nano you will be able to save and close. Again, ctrl-o ctrl-x to save your changes. You will now need to set a bunch of environment variables to make sure the code will compile correctly. $ export SCALA="$SCALA_HOME/bin/scala" # Shouldn’t it be =/usr/bin/scala ? You have two more files to make changes to, and then we can run the compile and start the application. For this modification, we need to make a couple of setup changes to the database script so that it will work correctly with your password you setup earlier. You will want to make one final change, and that is to change the default port to port 80 instead of port 9000 which is what is in the code by default. If you have any problems, or questions about this, please feel free to let me know. Teachers then test students' pattern knowledge rather than their ability to memorize single words. For example, a teacher might have students work with twenty words during a word study cycle and then randomly test students on ten of those words. In word study, teachers encourage students to compare and contrast features in words. One common method for doing so is by having students sort words. Word study provides students with opportunities to investigate and understand the patterns in words. Knowledge of these patterns means that students needn't learn to spell one word at a time. Package sun-java6-jdk is not available, but is referred to by another package.